This salad needs to be in your recipe books, pinned on your dinner inspiration board, printed and plastered all over your kitchen, and made like...immediately. Sorry for that. But seriously. This salad is ridiculous. In a good way. A couple of weeks ago a friend of mine came over for lunch and tea. She said she'd bring lunch if I'd do the tea- score! What I didn't know was she would bring a salad that I would fall in love with so hard that I immediately would say, "I need this recipe!" Yeah it was that good. Long story short- it wasn't her recipe, but a dear friend of hers. I got the recipe and was delighted as all could be. But then something weird happened- I dreamt of this salad. I craved it whenever I opened my bare and super sad refrigerator looking for a measly lunch to make myself. I whole heartedly wished one of those times I would find this salad, in all its glorious salad glory smiling at me from the bottom shelf. Nein. Then it happened- we ate turkey and we had leftovers. A lot of leftovers. I already knew where this was going. That salad. So I gathered up ingredients, played around a little with the recipe and made a GIANT batch. My husband and I ate 1/2 of the bowl (because like I've said before- we're humungous gluttons) Side note: love that word. No not "glutton"..."humungous"! We should really use that word a lot more. It's fun to say, "Hu-mun-gous"...mmmmm. If you've got leftover Thanksgiving turkey (like we do) this would be a great, LIGHT, day-after recipe to make! Just don't eat 1/2 the bowl. 1. Make the dressing first: In a non reactive sauce-pot, combine your chili sauce, vinegar, coconut milk, brown sugar, garlic, peanut butter, ginger, and soy sauce. Gently heat over medium until it comes to a boil. Once it boils, turn down heat and simmer until thickened- about 5-8 minutes. Take off heat and add lime juice. Allow to cool 10 minutes before proceeding to next step. 2. In a large bowl combine shredded turkey and 1/3 cup of your dressing. Toss well. 3. 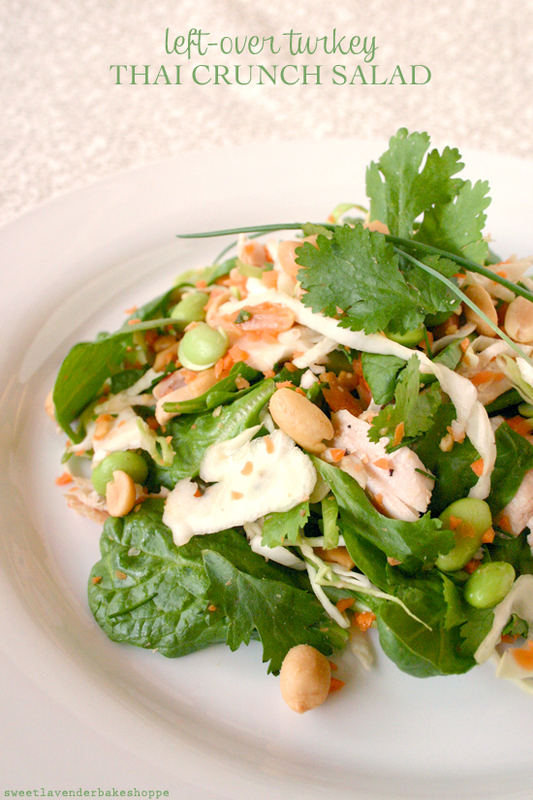 Next, into same bowl as turkey, add your green cabbage, spinach, edamame, cilantro, chives, carrots, and peanuts. Toss well. 4. 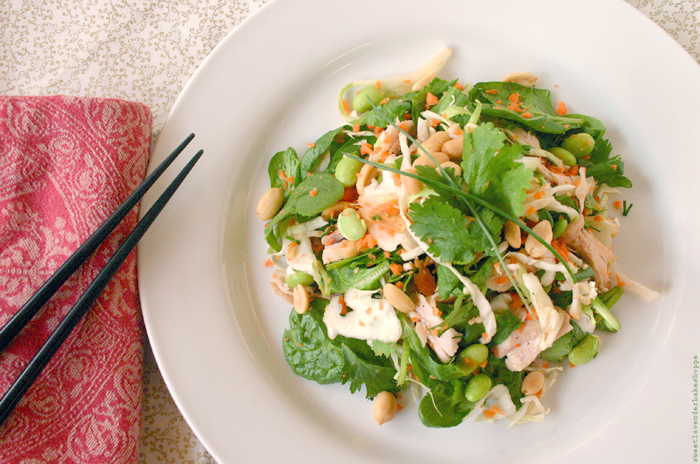 Drizzle with more dressing- enough to coat, plate up and garnish with reserved chopped peanuts! **OF COURSE you can do this with chicken! Just substitute chicken breasts for the turkey- enough to make 3 cups- about 3 breasts. **Works great with the recipe halved too. **Vegetarian/Vegan Option- substitute extra firm well drained tofu for the turkey! Just dice it. ** Can be prepped up to step 2 a day before. As soon as dressing hits rest of salad ingredients, I would serve immediately. have got much cleaг idea about fгom this article. Mmmm yum that looks delicious! Definitely going to try this!